An extended lesson in the differences between colds and influenza has distracted me from cooking lately. Mid-December, I picked up a cold in London. When I got back, a friend passed on his flu. I am the victim of the Double Whammy. Now that I’m feeling better, I am picking up my wooden spoon once again. Grub is the suitable kind of dish for my recuperation and during this windy, rainy days. This recipe invites adaptations. As written, it’s comforting. I came up with some ideas that made it more interesting to me. You’ll find your own way of revising it to your taste. 2. When ready to cook, put a tablespoon of oil in a large skillet (ideally, it will hold the lamb in one layer, or nearly so) and turn heat to high. When hot, add lamb. Cook, undisturbed, for about a minute, then stir once or twice to loosen lamb from skillet. Cook another minutes, then stir again. Add scallions, if using, and cook, stirring occasionally, until scallions glisten and shrink a bit and the meat is about medium. 3. If you want a slightly saucier mixture, stir in 1/4 cup water and cook another minute. Serve hot over rice, garnished, if you like with cilantro. I used ground lamb. I haven’t yet made it with minced lamb shoulder, but intend to try it that way one of these days. Using ground lamb, however, means that there will be considerably more liquid in the form of fat. I drain most of it off before finishing. I add a variety of other ingredients to finish it. Tonight, as you can see in the photo, I added chopped, blanched lacinato kale. 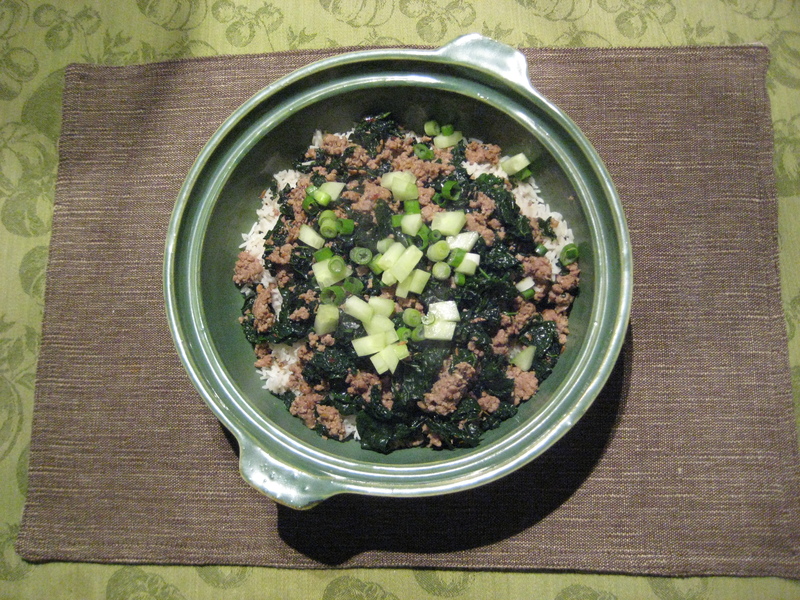 When I put it into the serving bowl, I topped it with diced cucumber, scallions, and cilantro. I also drop a dollop of yoghurt on the side to work in slowly as I eat it. (My preferred yoghurt is Redwood Hills Goat’s Milk Yoghurt). A very tasty, quick dish that suits a winter night. I keep meaning to increase the cumin and pepper flakes, but tend to forget. Chopped tomatoes?